Bjorn Andersson is former Swedish footballeer. He played mostly as a left back but occassionally could also act on the right side as well as in the midfield. Bjorn was strong and reliable player who could send good long passes from back line and even making some attacking moves on flank. Andersson was not yet 19 years with the squad of first division club Osters IF, for which he was active from 1970 to 1974 in the Allsvenskan. By the end of the season, on 27 October, he moved to Germany for the Bundesliga side FC Bayern Munich, for which he made his debut on 23 November (Round 14) in a 2-2 draw at home against Rot-Weiss Essen. His only Bundesliga goal he scored on 19 April 1975 (Round 28) in the 3-1 victory at home against Tennis Borussia Berlin. In the three seasons for Bayern Andersson played 47 league, 5 DFB Cup, 2 world cup matches and 11 in the European Champions Cup. Returned to Sweden in 1977 and completed three seasons with his former club with whom he won two titles. He then played another two or three seasons with Markaryds IF or Vallentuna BK. Andersson played between 1972-1977 28 times for the senior national team, scoring a goal. Personal highlight for him was participation in the World Cup 1974 in Germany, where he played in Group III of the 1st Final round three times and in Group B of the 2nd Final Round, the 0-1 defeat against Poland. 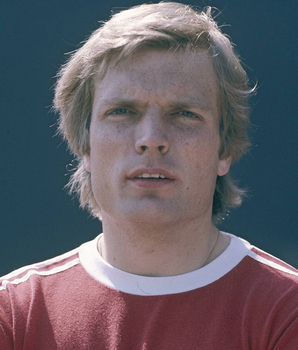 He won Intercontinental Cup in 1976 with Bayern, European Cup in 1975, 1976 with FC Bayern Munich ,Swedish league in 1978 with Östers IF and Swedish Cup in 1977. Andersson was from the mid-1990s, with Bayern Munich in the young active region, interrupted by an eight-month stay in Sweden IS Halmia in 2000. In the 2003-04 season he was assistant coach of the Bavarians with Michael Henke. In early 2009 he returned to Sweden and took a job with the Svenska Fotbollsakademin in Stockholm to educate players and coaches.